After reading Mei Yee’s Puchong Food Guide, I asked her to take me for Japanese buffet in Bandar Puteri Puchong. But she told me about this Thai place just across the road called A Wet Thai Restaurant. The restaurant name caught my fancy so I decided to try the food there instead. Unless you live or work in Puchong, it can be a maze for those with poor direction sense. Good thing rif goes to Puchong for work at least once a year — he knew just where the restaurant was. Unlike most Thai restaurants in KL, this place is non-halal (yay!). Between the four of us, we shared the Thai Deep Fried Pork Trotter, Tom Yam Seafood Soup, Thai Deep-fried kangkung and Pandan chicken. The pork knuckle was pretty good. 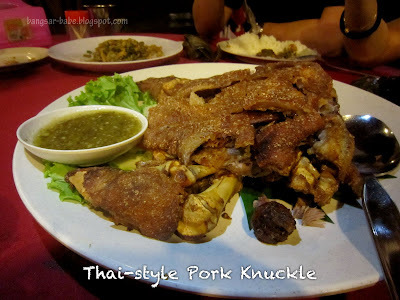 Crispy on the outside with a moist centre, this tasted best when eaten with the Thai green chilli sauce provided. Portion was huge but since I was there, finishing this was an easy feat. Muahahaha! Otherwise, it’s best to share this with 5-6 people. 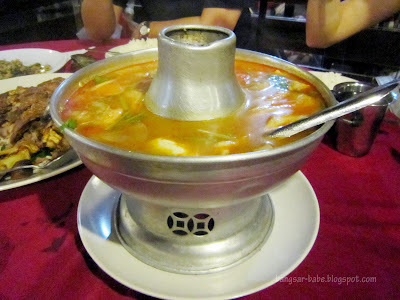 Our tom yam seafood came with a metal pot with a burner to keep it warm. 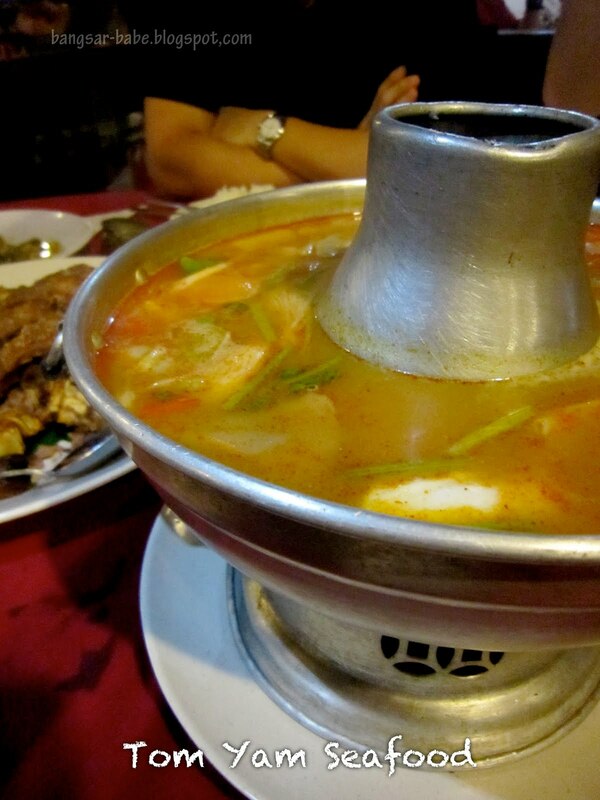 Lukewarm tom yam is a no-no for me. Tastewise, it was adequately spicy, but I like my tom yam fiery hot and sour. The seafood was not the freshest I’ve eaten, but still decent in my books. The batter-fried kangkung was addictive. Once you start, it’s hard to stop…until the plate is wiped clean. I liked that the batter wasn’t overly light, giving the vegetables a good crunch when bitten into. The light ones would just ‘melt in the mouth’. No-shiok. 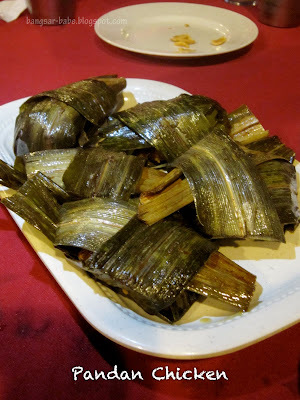 I’ve never been a fan of pandan chicken, partly because the pandan leaf is a pain to remove. The other reason is because the chicken pieces tend to be drier that usual. A Wet Thai’s version was nice and moist, but I still wasn’t a convert. Give me green curry chicken anytime! Instead of plain water, you are served pandan flavoured water which helps cool the body down from the heat. Pardon the lack of pictures; my camera battery died just as I took a picture of the pandan chicken. All in, the food was quite decent and prices were reasonable. I’m not sure how much each dish cost, but we paid RM90+ for all the above. Thanks for recommending this place to me, Mei Yee! Verdict: Pretty decent Thai food, and it’s non-halal! 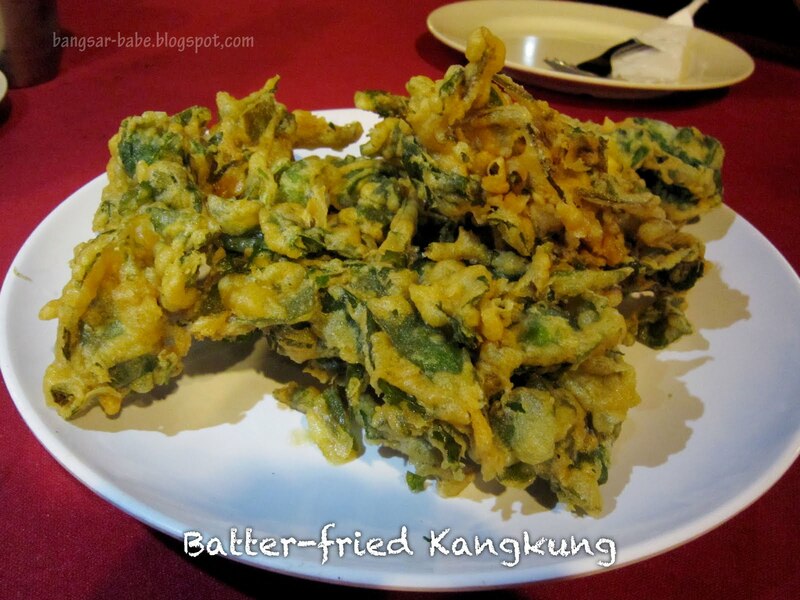 Batter fried kangkung is something new to me. Good stuff. Cheras one is Ahroy Thai I think? Same? I want … PORK! 🙂 Thai Pork!! Julian – Come back KL…or go to Bangkok! Sean – Yeah, I'd rather get stuck in Puchong than in Cheras! Hiya, u should try AhRoy Thai in Taman Segar Cheras. U can park at Leisure Mall. AhRoy is just next to Hong Leong Bank opposite the mall. I go there for 1 dish… Lemon grass thai salad. The other dish is nice but u can have better 1. I like AhRoy better then Ah Weit. 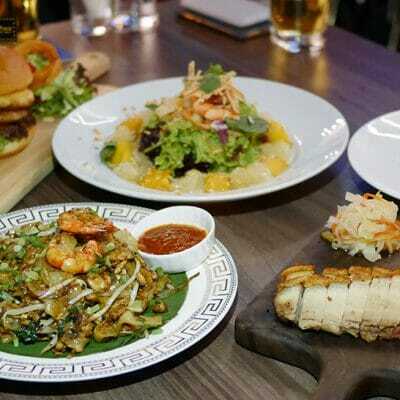 :) Ah Roy also have some dish that we dont see on other menu. But i alwiz stick back to the usual. What the father day dinner? Thought celebrating dinner at Awet Thai, puchong.. the person incharge here said ini tak ada , itu tak ada???? Very frustrated …no time to go other place..